Flavoured milk and fruit juice cartons are made from a packaging material called liquid paperboard (LPB) which consists of cardboard, plastic and sometimes a thin layer of aluminium foil. AAA Recycling Centre can collect and recycle LPB cartons and give you a 10c refund for every container that qualifies for state government’s CDL scheme. LPB cartons are also used for things like custard, sauces and soups, these can also be recycled, but are not part of the deposit refund scheme. AAA Recycling Centre gives 10 cent refunds for plastic bottles, glass bottles, cans and flavoured milk / juice cartons when they are brought to our recycling facility. The milk and juice cartons you recycle with AAA Recycling Centre are returned for reprocessing, where they are reconstituted into recycled paper, toilet paper and cardboard products like egg boxes. The name given to the long life, multi-material packaging used for juice cartons is ‘Tetra Pak’ aseptic brick. This innovative packaging process allows liquid food stuffs to remain shelf-stable without preservatives or refrigeration. Comprised of 6 layers of materials, the Tetra Pak aseptic brick allows for light weight, efficient, non-refrigerated shipment and storage of liquid foods. If you’re in the Burton / Salisbury area of Adelaide’s Northern Suburbs and would like to recycle your cartons for cash please call: (08) 8280 6350. 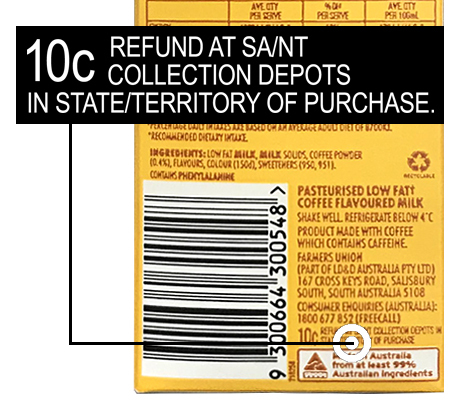 There is a 10 cent deposit and refund on most flavoured milk and fruit juice cartons in South Australia, check the label to see if the deposit / refund applies. AAA Recycling Centre is one of Adelaide’s leading carton recycling facilities. Every week we receive thousands of cartons that qualify for the South Australian government’s container deposit refund scheme. can be returned to AAA Recycling Centre to collect a 10 cent refund for each carton. What happens to Recycled Cartons? Tetra Pak aseptic brick cartons are made from 75% long fibre paper, 20% low density polyethylene and 5% aluminium. The material from recycled aseptic bricks is reused in many industries. The paper fibres are recovered at paper mills and make excellent raw material for the production of corrugated cardboard. The paper is separated from the other materials in the brick using a process called hydrapulping. Hydrapulping uses water and industrial strength blenders to separate the paper from the polyethylene and aluminium layers. The paper is recycled, leaving the polyethylene and aluminium as residual by products. The polyethylene and aluminium residuals are repurposed in a variety of ways, often used by the cement industry for energy recovery and bauxite replacement or to make products like roofing materials, buckets, and brooms. Every recycled beverage carton that’s given a new life, protects natural resources, reduces climate impact and contributes to the community. When paper is disposed of in landfill rather than recycled, it creates methane as it breaks down. Methane is a major greenhouse gas that contributes to global warming with a life span 21 times longer than carbon dioxide (Visy Recycling). Manufacturing recycled paper can use up to 90% less water and 50% less energy than making it from trees (Sustainability Victoria). Using recycled paper saves trees. For every 100 reams of recycled office paper that is printed doubled sided will save two trees, more than one tonne of greenhouse gas and almost a cubic metre of landfill space compared to 100 reams of paper that is not recycled or printed doubled sided (Sustainability Victoria). How juice and flavoured milk cartons are made … and reused. Paper can be recycled up to eight times (AMCOR). Paper & cardboard can be recycled into new products. Australia uses approximately 3.5 million tonnes of paper & cardboard every year.